Jabber simplifies communication and enhances productivity by unifying presence, instant messaging, video, voice messaging, desktop sharing, and conferencing capabilities into a secure easy-to-use app. In the upper left corner of the Jabber hub window click the Presence drop-down menu. Start a call with your first contact. Start a second call with another contact; the first will automatically be placed on hold. Click the More Call Handling icon. Press the Merge with Specific Call icon. Repeat the steps above to add more people to your call. You can have a maximum of eight people on the call, including yourself. While connected to a call, answer the new incoming call; this will place your current call on hold. During an active call, click the More (...) icon. Enter the number or use the predictive search option to dial by name. Click the green Transfer icon to complete. Use the Call Control dropdown menu located in the lower left corner of the main Jabber window. Click this menu to bring up its options. Select New Number... to open your Calls Preferences window. In the New Number text box, enter the phone number you want to forward calls to. You can enter a 5-digit Northwestern extension, or a 10-digit off-campus number. Don't include the 9-1, and leave out the dashes. Close the window when you're done. 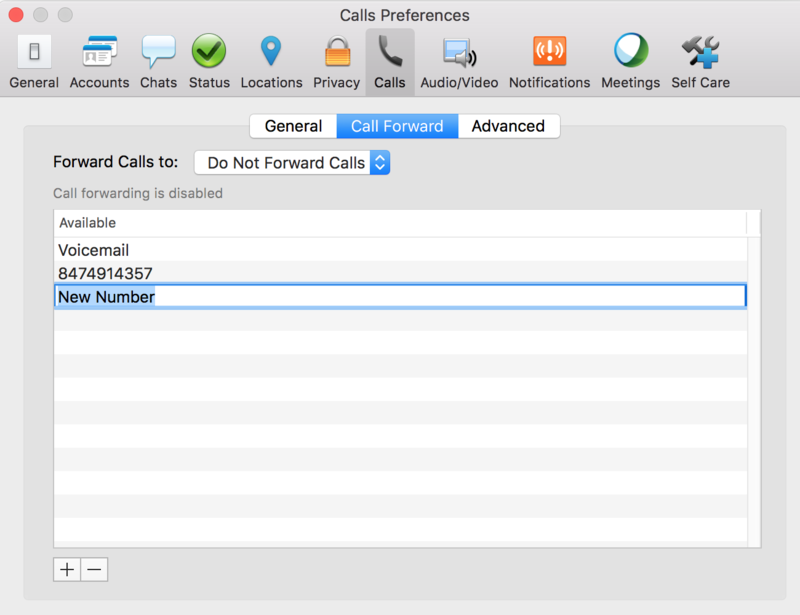 A small banner will be displayed next to the Call Control dropdown menu as long as your phone is forwarded. Select Do Not Forward Calls. For more information see Cisco How-to Videos or Jabber for MacOS User Guide.